The support, that is probably poplar wood, is likely to be composed of a single board with a single horizontal cross-grain baton on the reverse. The panel is in stable condition. There is evidence of a partial vertical split, now repaired in the central upper portion of the panel. The painting has been conserved several times, and the most recent campaign includes significant inpainting in particular to cover worn areas of paint. Aim of the present technical examination: To provide technical evidence towards an assessment of the materials used for the painting and aspects of its condition. X radiography, light microscopy, infra-red photography, UV photography, infrared reflectography. 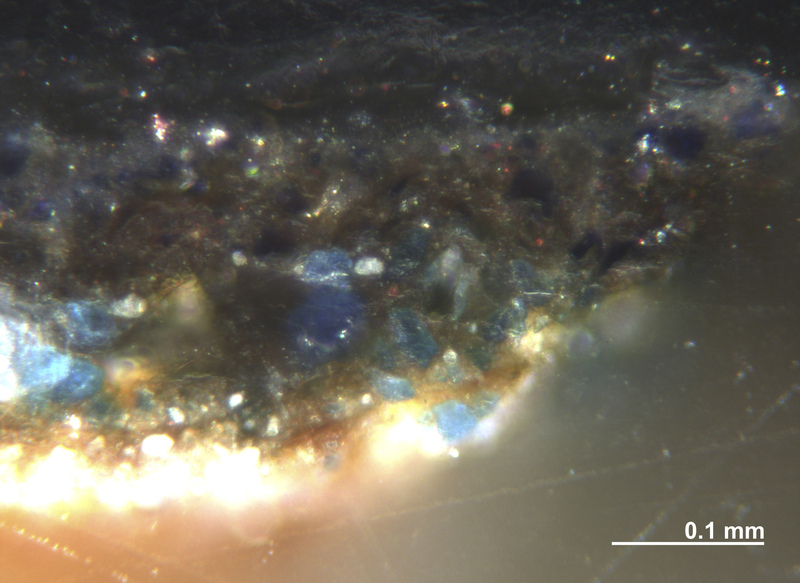 Pigment identification was done using light microscopy supplemented by elemental analysis of two samples using SEM-EDX, taken from the sky - CIA2315_01 – and from the Virgin’s proper right shoulder - CIA2315_02. 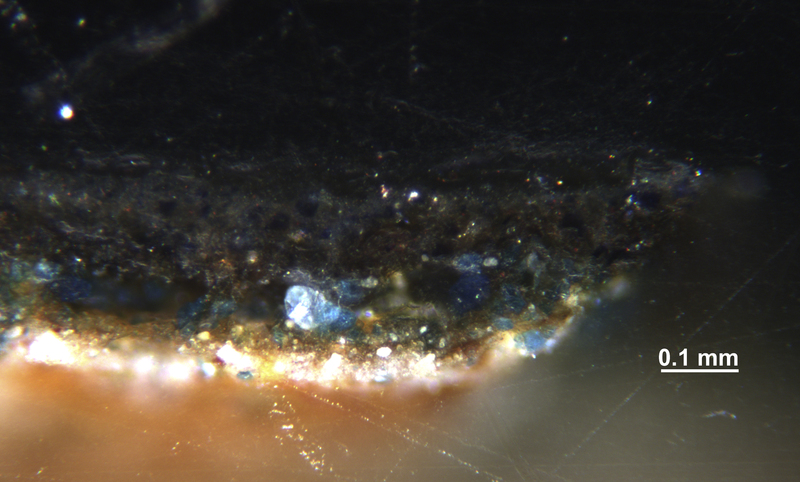 A sample from the sky was prepared as a cross-section (CIA2315_01). 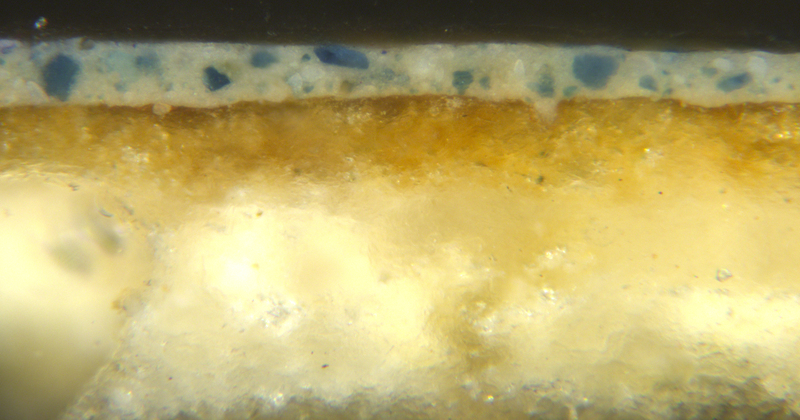 Examination of the sample under the light microscope showed two layers of an off-white ground applied to the panel: Elemental analysis indicated the use of a first layer of coarse grained gypsum typically bound in glue gesso grosso followed by the application of a layer of gesso sottile, fine-grained gypsum. The use of gypsum (in one of its natural forms: calcium sulphate dehydrate, CaSO4∙2H2O or natural anhydrite, CaSO4) was suggested by the presence of elemental Ca and S using SEM-EDX. The X-radiography documents several losses to the paint and ground in particular around the on the vertical split and on the right edge of the panel, where they have been filled using a lead-based compound or other X-ray absorbent material. Other losses have been filled with a different filler that does not absorb X-rays in the exposure range. 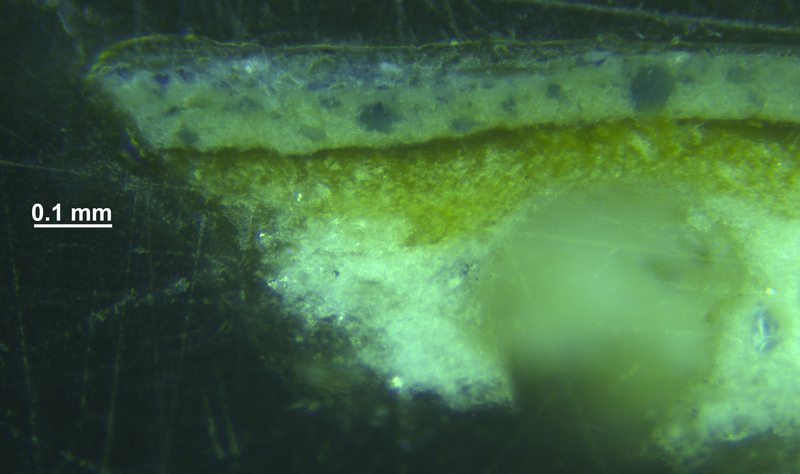 The UV image shows a slight surface fluorescence of the moderately aged varnish coating. 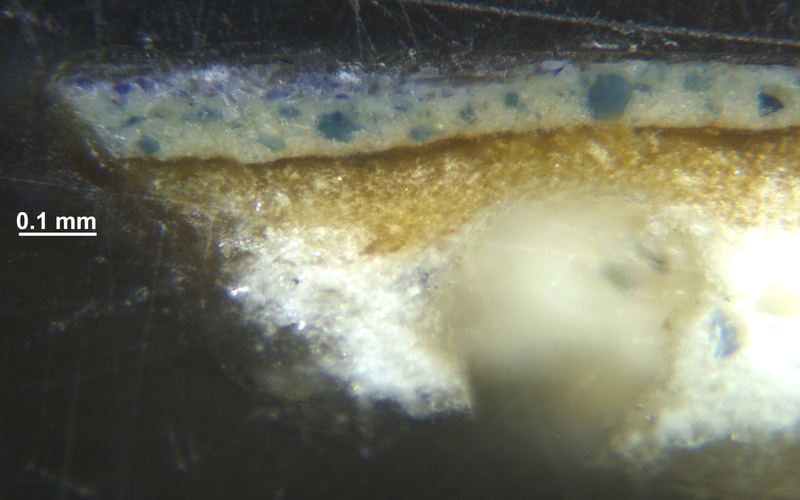 Cross sections show the application of two layers of varnish. 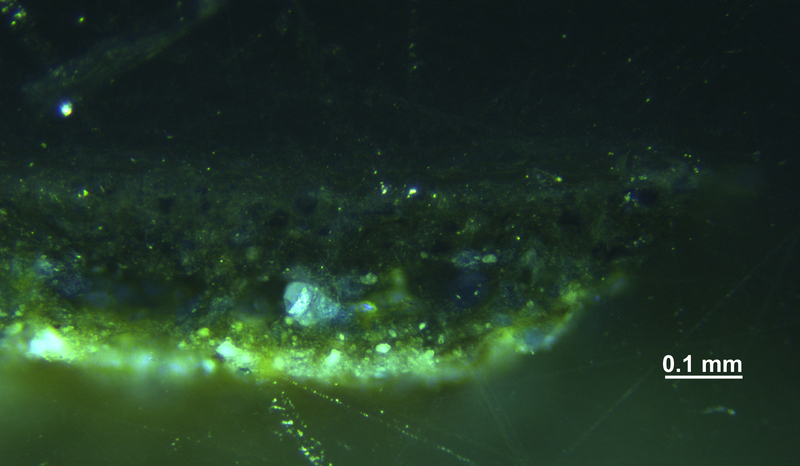 The Ultraviolet photograph of the painting highlights some of the areas of retouching, associated in particular with a crack along the tree on the left and damages along the edges of the panel. 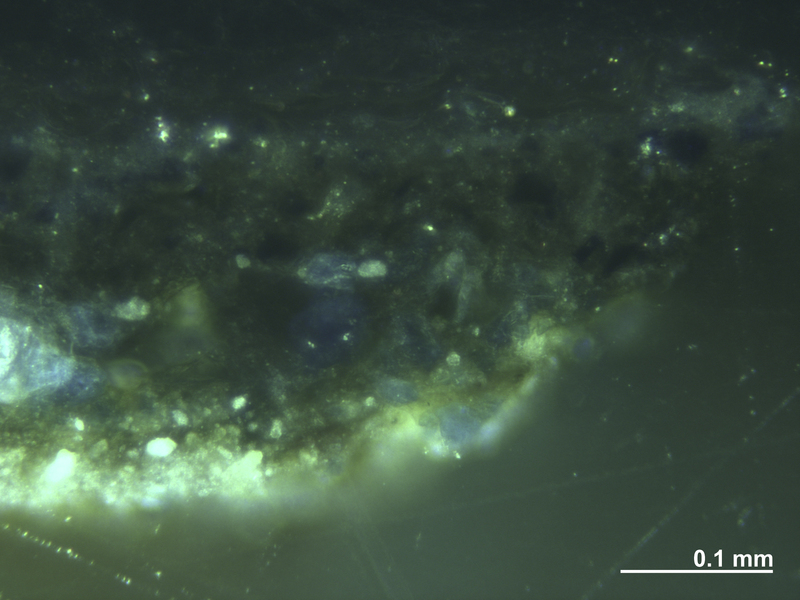 A range of pigments were identified in passages of original paint using a combination of surface microscopy supplemented with elemental analysis. An X radiograph of four plates was taken in order to provide information about the artist’s handing of paint, and aspects of the structure and condition of the painting. The figures in the composition appear to have been planned at the outset. A reserve has been left for the figures that contrast with the relatively dense sky paint that contains a higher proportion of lead white pigment. No significant changes in composition during execution in paint are evident in the X-radiograph. On this basis it might be concluded that the composition is likely to have been copied from another version, or transferred from a cartoon, though it was not possible to identify the method of transfer based on evidence from X radiography. Infra-red photography (that is sensitive to reflected infra-red radiation to about 1.0 micro-meter) was carried out to document the presence of underdrawing, the use of pigments and the condition of the painting. Charcoal was used for drawing some details of the figures, such as the hair of the Christ Child and Infant S. John and the features of the faces, while the black outlines of the Virgin’s hands have been overpainted to reinforce the drawing. A sample from the Virgin’s blue drapery that has darkened somewhat (CIA2315_02) showed that beneath some overpaint that contains Prussian blue the original robe was painted using a glaze of natural ultramarine blue over a layer of azurite pigment. 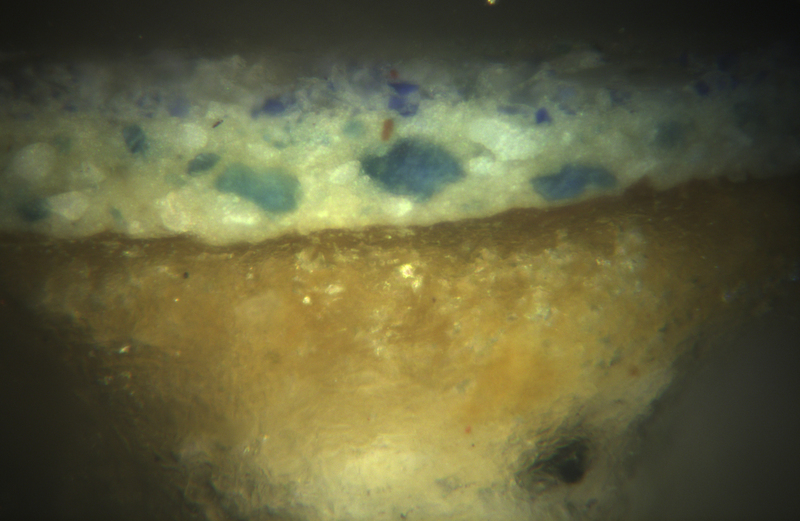 The sample taken from the sky showed a similar structure, with a thin layer of lapis over azurite mixed with lead white pigment. (CIA2315_01). 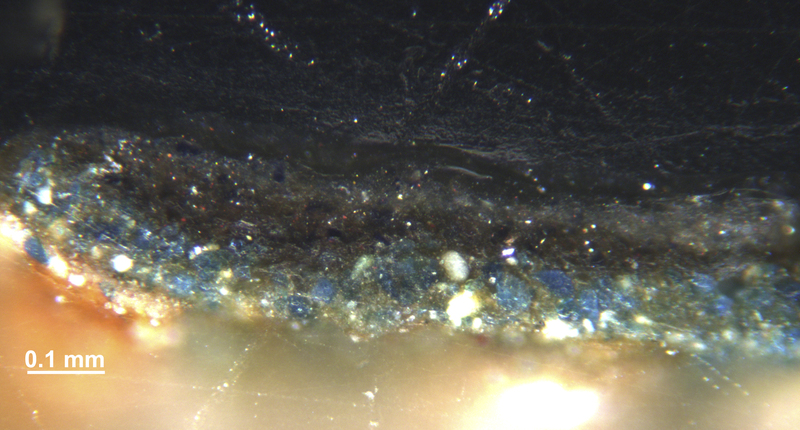 The observation of details of the painting under the microscope has provided information about both the original paint and the restored areas. Flesh, for example in the area of the thumb of the Virgin’s proper left hand is painted using a mixture of lead white, azurite, vermilion and a red lake; the poppies are painted using a vermilion underlayer, superimposed by a mixture of lead tin yellow and copper green, and finished with a red lake glaze; the Virgin’s red dress comprises a red lake glaze over a lead white underpaint. Lead tin yellow mixed with a copper green pigment was used for painting the foliage behind the figures, whilst the copper green pigment is used alone for the trees in the background, that have browned. Close surface examination showed more extensive retouching of the painting, including flesh, the drapery of the child on the right, the bird that appears almost entirely reconstructed, abraded areas of the Virgin’s robe, jewels and the halos. Hand painted cracks part of a restoration campaign are evident in a number or areas, such as the hand holding the bird to mimic the craqueleure pattern of the original paint. Each and every statement in this report is made without responsibility on the part of the Institute, its members, servants or agents. Neither the Institute nor any member or servant of the Institute on its behalf will express any opinion as to the authorship or value of a painting or other work of art and the use in any report of the name of an artist ascribed to a work by its owner is for purposes of identification of the subject matter of the report only, and is not to be relied upon as a statement or expression of opinion as to the authorship of the said work.